This week is National Window Safety Week and we want to share with homeowners why it is so crucial to understand the importance of window safety for families. As spring arrives, there is a natural desire to open windows and let in fresh air. Please be reminded of these important safety tips to help protect your family. When it comes to safety, windows can serve many purposes within your home. Not only do they help with the internal temperature and air pressure of your home, they also keep you and your family safe during severe weather by blocking out wind, rain and other loose objects, while also providing a means of escape during home emergencies. Typically, especially with older windows, cold air can creep into your home through the glass panes in the winter, and create heat gain in the summer. At Royal Home Improvement, our ThermoKing windows are built to keep the heat out in the summer and keep the cold out in the winter, reducing your energy costs. These windows will pay for themselves over time with energy savings. These windows can also block harmful UV rays from entering your home, while still letting the beautiful sunlight shine through. During severe weather, it is important to stay away from windows, doors and outside walls. Turn off all heating, cooling and ventilation systems including attic and window fans. Place a combination of plastic and duct tape around all doors and windows and make sure they are locked. Our ThermoKing windows are built to withstand hurricane-force winds. These are currently some of the safest home windows on the market. 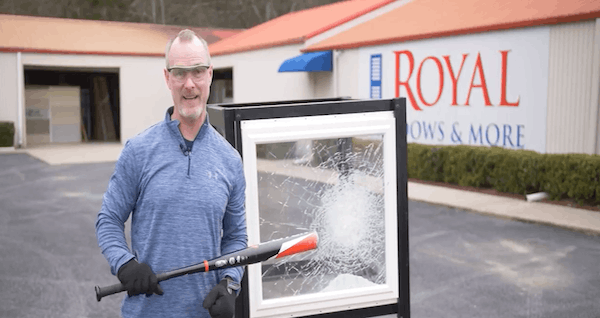 Here is a video to show you just how strong these windows really are! Make sure windows are not nailed or painted shut. Do not install air conditioners in windows that may be needed for escape. Keep furniture – or anything children can use to climb – away from windows. Children may use such objects to climb to an open window and potentially fall. Make sure at least one window in each bedroom meets escape and rescue requirements. Window guards, security bars, grilles or grates render windows useless in an emergency unless they have a release mechanism; update them if necessary. Keep emergency escape ladders in second- or third-story bedrooms and teach everyone in the home how to use them. Best of all, our trusted products are manufactured, installed and guaranteed by us! For more information on window safety, or to schedule a professional to consult with regarding your remodeling needs, call (877) 85ROYAL, or click here to learn more.